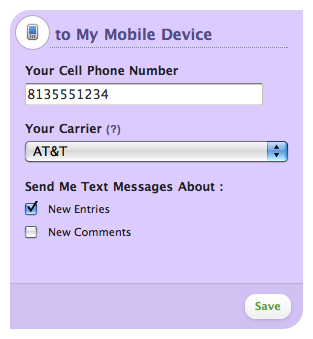 Set up text message notifications when someone submits your form (new entries) or when a user in your Wufoo account adds a comment to an entry (new comments). Enter your cell phone number (no dashes or spaces, for example: 5554446666). You can only use one phone number. Select if you'd like texts when you get New Entries, New Comments, or both. If your carrier is listed twice, choose the one that appears higher in the list—it's the most up-to-date. If for some reason that doesn't work, choose the next one in the list. Find your carrier's email to SMS pattern using Google or another search engine. If you can't find the info for your carrier, please contact them. Alternatively, you could use the Zapier integration to get text notifications. How can I view the whole entry? Since carriers have limits on how long texts can be, you might find that the form title is cut off, and you'll only see the first two fields in the text message (depending on the length of the field labels, you might see less). How can I customize the text message? While it's not possible in Wufoo to customize what the text will say, you can instead use the Zapier integration to customize what you want the text to say.